HUGO is a movie about the wonder and beauty of cinema - an elegy to the age of celluloid and hand-made special effects - a plea to preserve the fragile, crumbling history of this fantastic art form. In this aim, HUGO is a wondrous, magical success. But, far from being, conservative and nostalgic, legendary film-maker Martin Scorsese has shown us not just the past but the future of cinema. The nostalgia is matched by an equal wonder at the new technology of 3D - not piss-poor retro-fitted 3D - but delicately aligned, beautifully designed 3D designed to give us that same immersive, spectacular thrill as when those first cinema-goers gasped at the Lumiere Brothers' train arriving at the station. In this aim - in showing us both the past and future power of cinema, HUGO is a technical achievement that surpasses AVATAR and redefines what we thought was possible with 3D. 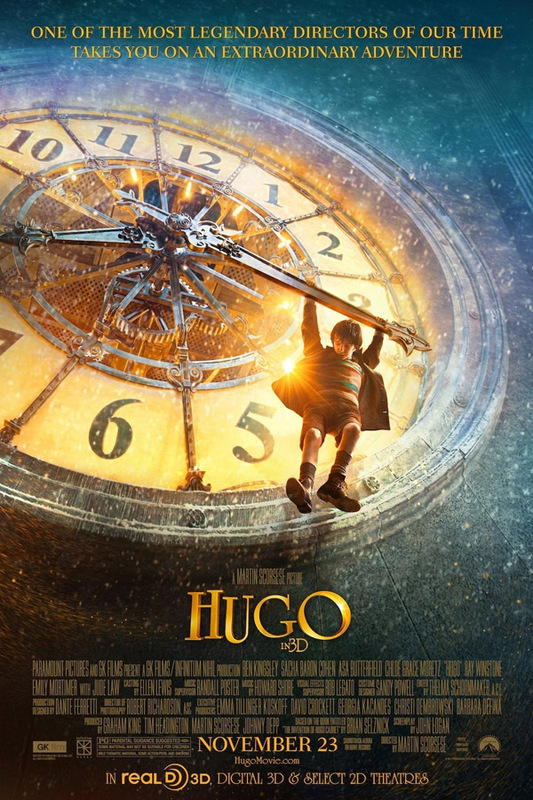 HUGO is, if ever there was one, a movie that demands to be seen in 3D and on the biggest screen you can find. HUGO is also meant to be a children's adventure - a physical comedy - a plea not to give up on love, or yourself. In that aim, HUGO is a tedious bore. So let's tackle these elements in reverse order. Hugo is the story about a young orphan boy (Asa Butterfield) who lives in a train station in a 1931 Paris heightened by fantasy and stunning production design. Hugo is a tinkerer - he loves to fix things - in particular the beautiful automaton his father left him. His love of mechanics lies in his loneliness and his need to find his own place in the world. Together with a plucky little bookworm called Isabelle (Chloe Moretz), Hugo scampers through the station, stealing little mechanical parts to finish his work, and desperately trying to avoid the station inspector (Sacha Baron Cohen) and his hound-dog. These chase scenes through the hidden passages and platforms of the station make up much of the tedious first hour of the film. The dialogue is minimal, as are the genuine belly laughs. Poor Sacha Baron Cohen does his best, but I get the feeling that Martin Scorsese just cannot direct physical comedy. Moreover, too many of his chase scenes through the train station are there to showcase the 3D and the spectacular production design but nothing else. They become repetitive. They don't advance the plot. The first hour of this two hour film could easily lose forty minutes. Then again, let's talk about that 3D and the production design. Dante Ferretti (SHUTTER ISLAND, SWEENEY TODD) has created a beautifully detailed, rich set that evokes a kind of super-Paris - a Paris as we would all imagine it to be in our wildest romantic moments. Always snowing - couples dancing - accordion music - little plucky girls in berets - steaming croissants - book shops that groan under the weight of beautifully engraved volumes - the Eiffel Tower always in the background. All this forms the environment for a kind of 3D cinematography that combines achingly superb attention to detail with Scorsese's trademark breath-taking tracking shots. The opening scene of this film, where we swoop through Paris, itself a giant automaton, then into the station, along the track, weaving through the crowd until we reach Hugo hiding behind the face of a clock - is a tour de force to match the Copacabana tracking shot in GOODFELLAS. Martin Scorsese and longtime DP Robert Richardson - both new to 3D - deserve credit for such an achievement - not just in creating a particular look for their own film - but in echoing and recreating some of the seminal scenes of early cinema. And so to the history of cinema. The second hour of the film, where the children are led through the history of cinema, first from Professor Rene Tabard (Michael Stuhlbarg) and then through Melies himself (Ben Kingsley) is just an absolute pure joy for any lover of the artform. I already mentioned the recreation of the Lumiere Brothers' train scene, but the pivotal recreation is of Melies film, "A Trip To The Moon" - see the Youtube clip below. The movie shows us the joy and wit of those early special effects and spectaculars, and the final montage is a thing of awe and beauty. I defy any film-lover not to start crying at the skilful direction of a scene that is at once a culmination of the technical achievement of the film, and its emotional high-point. The resulting movie is one that is, as I have said, not without its flaws. The first hour drags, and I do wonder whether children will engage with it. But for cinema-lovers, the second hour is pure joy and an experience I would happily repeat at the cinema, because this is a movie that assures us that despite the fashion for watching movies on mobile devices - sometimes magic demands a communal experience and a big screen. HUGO was released last weekend in the USA and Canada. It was released this weekend in the UK and Turkey. It opens on December 14th in France; on December 21st in Belgium; on December 23rd in India; on December 30th in Mexico; on January 5th in Russia; on January 12th in Australia and New Zealand; on January 26th in Israel and Spain; on February 3rd in the Czech Republic, Italy, and Poland; on February 9th in Germany, Hungary, the Netherlands and Portugal' on February 16th in Hong Kong and Brazil; on February 27th in Finland; on March 15th in Denmark, Singapore, Norway and Sweden; and on April 27th in Lithuania.